Bio/Personality: She likes to be by herself and doesn't always get along with others, strong willed but also has a soft side, she is will stick up for her friends and the people that she is with. She likes chilling by playing card games and by sparring. She also has a darker view on life and normally sees the darker side of life. Air Rage - (Medium) a gut of air that displaces the person that she angry at by flipping them upside down. 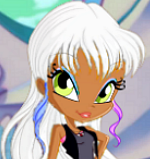 Appearance: Light gray/white hair with blue and purple streaks, it is long and normally in a braid or tided back. Darker colored skin. Bright green eyes. Will wear almost anything as long as it ain't pink. Why do you want to join Alfea? : Wants to learn more about her powers and how to use them. Background History (Childhood & High School):Grow up on Pyros, taught herself hand-to-hand combat as well as how to use her powers to the fullest. She and her younger brother were abandoned there by their parents when Shar was 10. When she was 14 and her brother was 7, her brother wondered off and Shar never saw him again. She blames herself for his disappearance and as a result her powers are slightly darker in nature. She is very much a lone wolf and has a hard time trusting but will fight to save the magic dimension from those that would harm the innocent. Her mother was an earth fairy that went to alfea and became a teacher there and her father was a wizard, they met on a blind date. She doesn't remember a lot from her life before Pyros, but the one thing that she does remember is that her parents loved each other, her and her brother and would do anything to save them and the magic dimension. Since starting at Alfea she has had a hard time learning how to not be socially awkward, and how to deal with being around large groups of people. Your profile has been updated! Please check to see if it's up to your desire c:! I'll send you a pm to when you can start the roleplay as I have to fix somethings on the forum first ! Thank you! That's pretty close to what i was thinking.